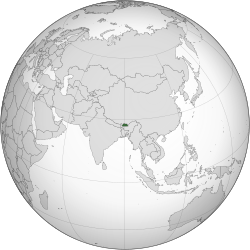 Coordinates: 27°25′01″N 90°26′06″E﻿ / ﻿27.417°N 90.435°E﻿ / 27.417; 90.435 Bhutan i tiko ra Axiya. ↑ "9th Five Year Plan (2002–2007)". Royal Government of Bhutan. 2002. Retrieved 22 August 2011. ↑ "National Portal of Bhutan". Department of Information Technology, Bhutan. Archived from the original on 23 April 2012. Retrieved 22 August 2011. ↑ "2016 Human Development Report". United Nations Development Programme. 2016. Retrieved 21 March 2017. Tluka leri rihetelele ku lulamisiwa hi 18 Nyenyankulu 2019, nkarhi kuri 12:29.